Media captionMark Carney said an announcement on his future would be made in "due course"
Mark Carney has said he is willing to stay on as governor of the Bank of England if it will help the government "smooth" the Brexit transition. Mr Carney is due to step down from the role in June 2019 and told the Treasury Committee that he has been talking to the chancellor about his future. He said he was happy to do whatever he could "to promote a smooth Brexit and an effective transition at the Bank". Mr Carney added that an announcement on his future would be made soon. However, he added that it was not down to him to make that announcement. "We (the Bank) have a very important supportive role to make sure whatever Brexit the government negotiates, that Parliament decides, that that is as much of a success as possible," he said. "I made them aware of my willingness to do what I can to support the process. "It's an important time and we have an important supporting role to make sure that, whatever Brexit the government negotiates and Parliament decides, that it is as much of a success as possible. Providing a measure of continuity during this period should help that." After the hearing, Treasury Committee chair Nicky Morgan said: "Stability is vital during this important period. The sooner the government provides clarity, the better." 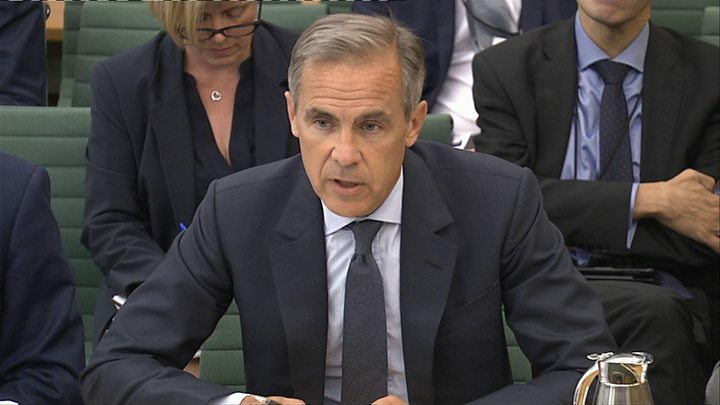 There has been speculation about the future of Mr Carney, who replaced Mervyn King in 2013 to become the first non-Briton to be appointed in the Bank of England's 300-year history. He previously announced that he would step down on 30 June 2019 - two years short of the usual eight-year term that governors tend to serve. But there has been a lot of talk in recent days that the government would like him to remain in post for longer. It is thought the Treasury would like to allow more time to recruit his successor, amid concern that few candidates would want to take on the role during an unpredictable stage of the Brexit process. The pound edged up slightly against both the dollar and the euro after Mr Carney's comments. Former Monetary Policy Committee member Andrew Sentance told BBC Radio 4's World at One that the speculation about Mr Carney's position was "not very good for the credibility and independence of the Bank of England". He said the process of appointing a successor should proceed in line with the timetable initially agreed with the governor and added: "It seems an awful lot is happening in this appointment process behind the scenes and that is not good in terms of the independence of the Bank of England." Mr Carney has divided opinion, receiving both praise and criticism. He is credited with deftly handling the UK economy as it emerged from the upheaval of the 2008 global financial crisis. But pro-Brexit campaigners accuse him of "crying wolf" before the 2016 referendum, when he predicted voting to leave the EU could trigger a recession. Some, like former UKIP leader Nigel Farage, have called on him to resign. Last month, he was labelled the "high priest of Project Fear" by the leading Conservative Brexiteer Jacob Rees-Mogg. His comments came after Mr Carney warned that the prospect of a no-deal Brexit was "uncomfortably high". He told the BBC's Today programme that such an outcome was "highly undesirable". Mr Carney has also faced criticism of his so-called use of "forward guidance". Under his leadership, the Bank had originally said it would not consider raising interest rates until the unemployment rate fell to 7% or below. But when that seemed likely to happen much sooner than anticipated, the Bank altered its stance, saying it would focus on a range of economic variables instead. Interest rates have now risen twice - to 0.75% - since he took over.